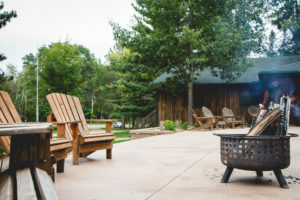 Below is an overview of our gathering areas; where your group can just relax together. 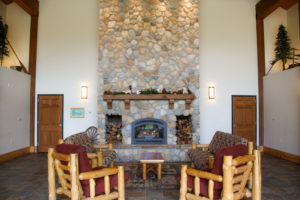 This comfortable, cozy lounge with its beautiful stone fireplace provides a great atmosphere for fellowship and relaxation. Browse from our collection of board games, card games, and puzzles. Whether you are looking for an early morning eye-opener or are in need of an afternoon “second-wind,” we have what you need. Covenant Grinds provides specialty coffee drinks and teas needed to keep you warm during the winter and awake during the summer. Covenant Grinds is located in Fireside Lounge. 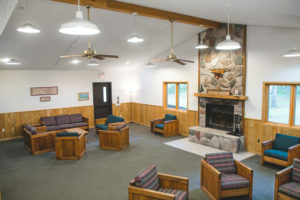 Inside Bald Eagle lodge is a comfortable lounge. 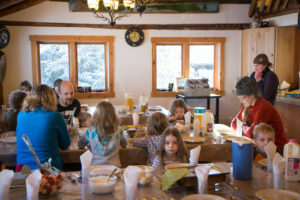 It has a beautiful stone fireplace, ample seating, a coffee area, and a kitchenette. You’ll also find plenty of board games and puzzles.